Create images with impact using over 70 professional effects that help you enhance detail, add contrast, evoke moods, and more. Design a look all your own by combining multiple effects and adjusting the strength of each effect. With the live previews in Perfect Effects 4 Free, you can see what each effect will look like on your photo before applying it. Your creative options are limitless and easy to achieve with the easy-to-use tools in Perfect Effects 4 Free. 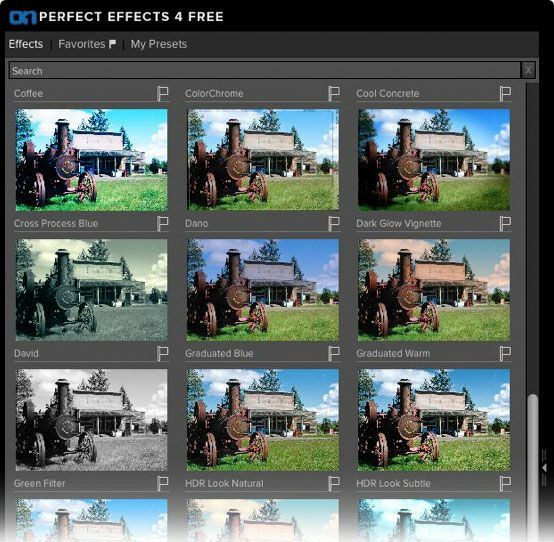 Selectively apply any effect to specific parts of your photo with the powerful masking controls in Perfect Effects 4 Free. Use the Masking Brush to apply effects to specific areas and the Masking Bug to quickly create vignettes and graduated filter looks. With a handy set of Basic Brushes, you can solve some of your most common digital photography problems exactly where you need. Use simple brush strokes to make areas darker, lighter or warmer. Add detail, glow or more color. You can also reveal highlights and recover shadows. Smoothly apply or remove effects to the specific areas you're working on without going "outside of the lines." Turn on the Perfect Brush when using the Masking Brush or the Paint-in Effect Basic Brushes. Blend effects to create amazing and highly stylized looks in Perfect Effects 4 Free. By changing the Blending Modes, you can control the brightness, contrast and color of the image to dramatically alter the appearance. And, by adjusting the opacity, you can control the strength of the effect.